BBC NEWS | Technology | Will Zune be music to your ears? Will Zune be music to your ears? 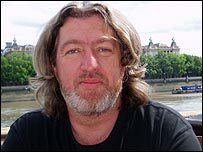 Regular commentator Bill Thompson looks over Microsoft's Zune player and download service and finds it lacking in pizzazz. Now that Microsoft has unveiled all the parts making up its Zune music service we can begin to see how it stacks up against the iPod and other MP3 players. The version of the player that comes in brown has attracted a lot of attention, though that may be just because it's one of the few novelties in an announcement that confirmed most of the leaks that had been circulating for months. 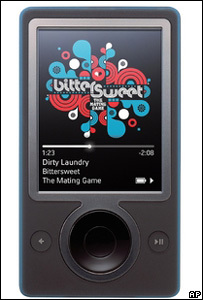 However, it's hardly going to make or break Zune in the market, and anyway it's surely only a matter of time before the player gets snap-on covers like many mobile phones or the Xbox 360. Prices aren't available yet, presumably because Microsoft wants to make sure that it undercuts Apple's pricing for the iPod and will wait until the last possible moment to reveal them. After all, Apple has just dropped the iPod's price below the Zune player's rumoured $299 (£160). Details of the store are sketchy, but as well as buying individual tracks there will be a "Zune pass" subscription service that offers unlimited downloads for a monthly fee. It's not clear whether you'll lose access to the tracks if you stop your subscription, but somehow I doubt that Microsoft would be foolish enough to do that. But there is one significant difference between the Zune player and an iPod, and that's wireless. The player comes with wi-fi, which means that lots of cool things become possible, stuff you can't do on an iPod because its only link to the world is through a USB cable. You won't be able to download music directly from the store to the player using wi-fi, although that must be coming soon. But you will be able to let other Zune users listen to your music by giving them tracks from your player via wireless, a feature that may well turn the heads of the white headphones brigade. Sharing music between players is an idea that's been around for a long time. 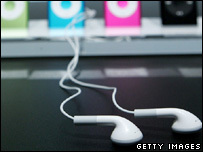 Tech journalist Andrew Orlowksi suggested a "Bluetooth iPod" three years ago, with a "what am I listening to?" menu option that lets other people on the bus or train listen in. It was a great idea, but it's not surprising that it has taken so long to happen. Microsoft and Apple, like the rest of the technology industry, will happily restrict the capabilities of their products to keep the entertainment industry happy, and anything that would seem to let users have control over the songs they have paid for is often unacceptable. Even the new "Zune to Zune" service is restricted in order to keep the record companies happy. You'll only be able to listen to a song you've been sent up to three times over three days, and then you'll be expected to buy it. There's no indication of how often you'll be able to share unprotected music from other sources, like songs ripped from CDs that you actually own, but the chances are that this too will be limited. Given the limitations, it may be too much to claim that player-to-player sharing is a way of "building community around new bands", as Microsoft product manager Scott Erickson put it at the launch, but it is an interesting feature that opens up many intriguing possibilities, and even limited sharing is a start. We should also remember that there is a good track record of hackers opening up Microsoft hardware, as happened with the original Xbox, so we may see more open sharing become possible for those willing to hack the hardware they own. And if Microsoft really does want to take on Apple then it will soon offer player-to-player streaming and other network-based services. Messenger, Xbox Live and online maps, anyone? While Zune is clearly aimed at Apple's iPod/iTunes there are other players in this market and they may well be rather annoyed with Microsoft. Creative, iRiver, Samsung, Archos and other companies making and selling music players will now have both Microsoft and Apple to compete with, and the chances of them being around in five years must be slim indeed unless Microsoft decides to let them in on its music store and services. Napster has already started to reposition itself, offering free 512MBb MP3 players to anyone who signs up for a three month subscription. It is trying to move music closer to the mobile phone model, where you get the hardware from your service provider at a deep discount, and pay through monthly subscriptions. It's a brave attempt to commodify what, for the moment at least, is a highly visible and branded product. And it goes completely against the Apple model, a model which now has explicit support from Microsoft, so I wouldn't hold my breath. Zune players will be out in time for Christmas, but things will get interesting in a year or so when those who were first to buy iPods start looking for replacements. Once these early adopters find that they can't buy a music player from anyone else because all of their expensively acquired iTunes downloads are locked by Apple's FairPlay digital rights management technology and will only play on an Apple player, they may get annoyed. If that annoyance turns into regulation obliging Apple to license FairPlay to others then Zune could be in the right place at the right time to pick up large numbers of users. As we have seen with the Xbox, Microsoft can afford to wait for the market to arrive, and once the switch from iPods begins it will be unstoppable. With all that is positive about the new player, it's a shame that the name is so difficult to take seriously. "Zune" doesn't work for me, and I can't see it ever taking off in the way that "iPod" did. So I doubt we'll ever find ourselves talking about "zunecasts", however successful Microsoft's latest foray into hardware proves to be.